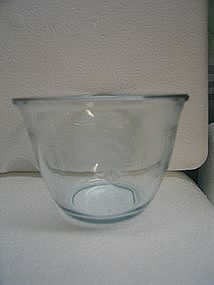 It is marked Fire-King Oven Glass. It holds 7 ounces and is slightly over 2 1/2 inches in height. There are no chips, cracks, breaks or rough rim, but has either a couple of light scratches or manufacturing flaws. There are some small imperfections, which could either be tiny nicks, or yet again, could be manufacturing imperfections. These areas on not on the rim, but on the side, close to the base. I need your zip code to calculate the postage.